The cava Mousse imperia (Glass Jar) has an original flavor to delight the senses with a soft texture, it is a Gourmet product up to the most demanding palates. 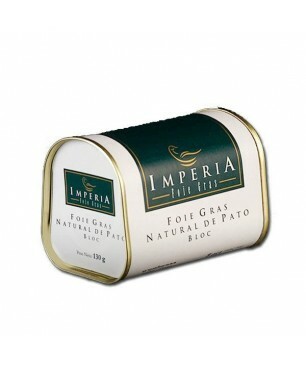 This exquisite product is made from duck Foie Gras, Cava, liver, poultry, milk, salt, egg and pepper. 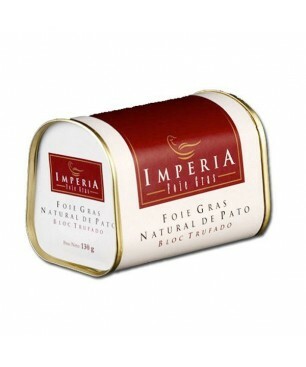 We recommend: Serve on toast accompanied by a crianza red wine or a good cava. The bloc of Duck Foie Gras Imperia nature contains 98% of liver duck farms selected in Riudellots de la Selva, Girona, Catalonia.It features a powerful entry into the palate and a stay in the mouth soft and delicate.Its texture and flavor exepcional gives it a versatility in the kitchen and service. Elvido C. el día 10/17/2017 Molto molto buona, da provare!! The Bloc de Foie Gras duck truffle Imperia containing 3% truffle and 95% duck liver farms selected in Girona, Catalonia.It features a powerful entry into the palate and a stay in the mouth soft and delicate.Its texture and flavor exepcional gives it a versatility in the kitchen and service.